1 Caption: What are you lookin' at? Filler number 2. I should still be in Rome as this strip airs. Rather than book a hotel for over a week, we've hired an apartment. It actually turns out cheaper to get accommodation ths way, and we get an entire apartment, with a kitchen, a separate bedroom, a neat wrought iron spiral staircase, free WiFi, and laundry facilities, instead of a tiny room with a bed and maybe a window. Hopefully as you read this we've been enjoying it for the past week, and not discovering that it overlooks a garbage landfill. 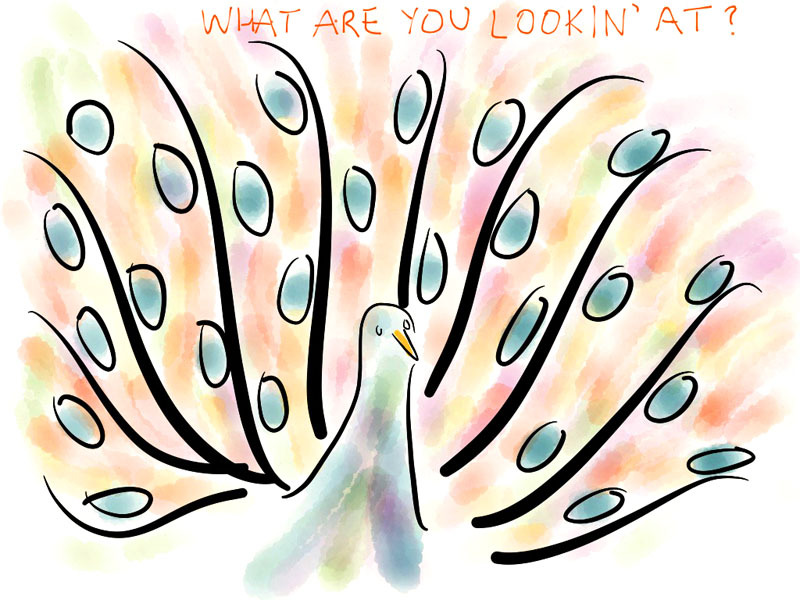 Today's drawing is titled "Arrogant Peacock". Last Modified: Sunday, 6 May 2012; 03:11:02 PST.